Gradient plasticity theories are of utmost importance for accounting for size effects in metals, especially on the grain scale. Today, there are several methods used to derive the governing equations for the additional degrees of freedom in gradient plasticity theories. Here, the equivalence between an extended principle of virtual power and an extended energy balance is shown. The energy balance of a Boltzmann continuum is supplemented by contributions based on a scalar-valued degree of freedom. It is considered to be invariant with respect to a change of observer. This yields unambiguously the existence of a corresponding micro-stress vector, which is presumed from the outset in the context of an extended principle of virtual power. 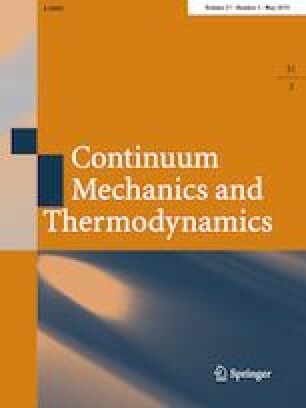 A thermodynamically consistent nonlocal evolution equation for the additional, scalar-valued degree of freedom is obtained by evaluation of the dissipation inequality in terms of the Clausius–Duhem inequality. Partitioning the nonlocal flow rule yields a partial differential equation, often referred to as micro-force balance. The approach presented is applied to derive a slip gradient crystal plasticity theory regarding single slip. Finally, the distribution of the plastic slip is exemplified with respect to a laminate material consisting of an elastic and an elastoplastic phase. The support of the German Research Foundation (DFG) in the project ‘Dislocation based Gradient Plasticity Theory’ of the DFG Research Group 1650 ‘Dislocation based Plasticity’ under Grant BO1466/5 is gratefully acknowledged. In addition, discussions with Matti Schneider on the topic are gratefully acknowledged.